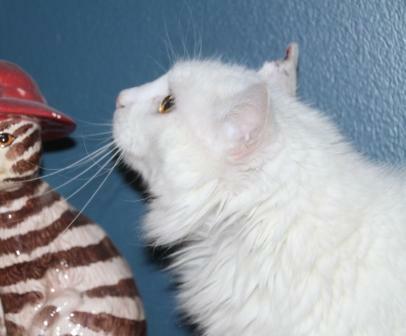 The neat thing about a white cat is that you can dye it different colors. Don’t believe me? Wait then and see. I have ordered pink dye color just for animals. When it arrives I will color Spirit Pink. She will not mind. If it helps to get her adopted because she turns into an exotic pink cat then all the better! her bowl, fresh water on the ready and super comfy soft beds. The latter is her favorite. Why the funny ear? She had a sore on the tip of her ear. At first the vets’ treated it as if it was infected. That was expensive. Then they thought maybe it was cancer – didn’t even want to think of that price tag. Finally, my favorite vet said, oh, it’s just cartilage gone crazy. For $75 he removed it and she is good as new! Thank goodness because her vet bills have been adding up over to several hundreds of dollars because of that ear. But once it is all healed and her hair grows no one will notice there was even a sore there. Spirit can hear fine – when she wants to. She has great selective hearing if you know what I mean. She likes to be held but does not go out of her way to find me. She does not start fights or get involved with fights, actually there are no cat fights at my house – they all get along fine. 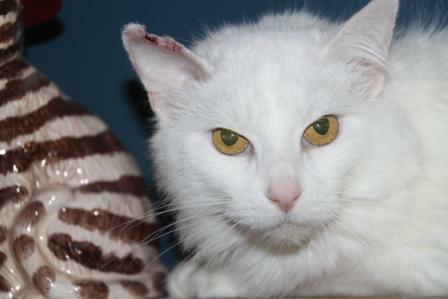 Irregardless, Spirit would love a home with just her or another cat. I doubt she would enjoy the attention of children – they may frighten her, she seems timid at times. She does not mind being brushed and she is gooda bout having her soft claws put on. 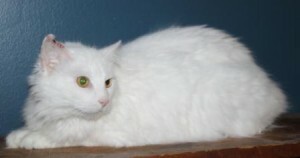 Spirit is available for adoption. If you are interested, please fill out an application and email it to us as an attachment. . Click here for adoption application. Medical: She is spayed, and up to date on shots. She has been tested for Feline Leukemia and has Revolution put on her once a month. 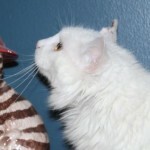 Soft Claws: Because PetsConnect has moved to a no-declaw policy, we are using soft claws as a training tool for our foster cats. Soft Claws are soft plastic nail caps for cats. This cat has them on her front paws. To learn more about Soft Claws.